Last weekend I went exploring the streams and lakes in the countryside near Konstanz to search for Moderlischen and determine the possibilities for doing fieldwork to investigate group movement dynamics and composition in the wild. I was able to find them in some tiny streams leading to a small lake, showcasing some nice examples of collective shelter use and leadership and exploration of the stream, see the video below. Looking forward to starting exploring possibilities to start some actual field work on these populations. Recent research of colleagues and I at the University of Cambridge has revealed that sticklebacks with bolder personalities are not only better leaders but also less sociable than more timid fish. The behaviour of these bolder fish shapes the dynamics of the group. Throughout the animal kingdom, individuals often live and move together in groups, from swarms of insects to troops of primates. Individual animals may benefit from being part of groups, which provide protection from predators and help in finding food. To ensure that individuals reap the benefits of togetherness, group members coordinate their behaviour. As a result, leaders and followers emerge. Within groups, animals differ from each other in how they cope with their environment and often exhibit distinctive traits, such as boldness or sociability. Even three-spined sticklebacks, the ‘tiddlers’ collected from streams and ponds by generations of schoolchildren, can be described in terms of their personalities: some are bolder and take more risks, while others are more timid and spend more of their time hiding in the weeds. Research carried out in the Zoology Department at the University of Cambridge suggests that observations of these tiny fish, and how they interact with one another, could provide important insights into the dynamics of social groups, including humans. Jolle Jolles, lead author of the study, said: “Although we now know that the spectacular collective behaviours we find throughout the animal kingdom can often be explained by individuals following simple rules, little is known about how this may be affected by the personality types that exist within the group. Experimental design. Fish were tested twice for one hour in the risk-taking task during two subsequent sessions. During the pairing session fish could see and interact with one another through a transparent partition. 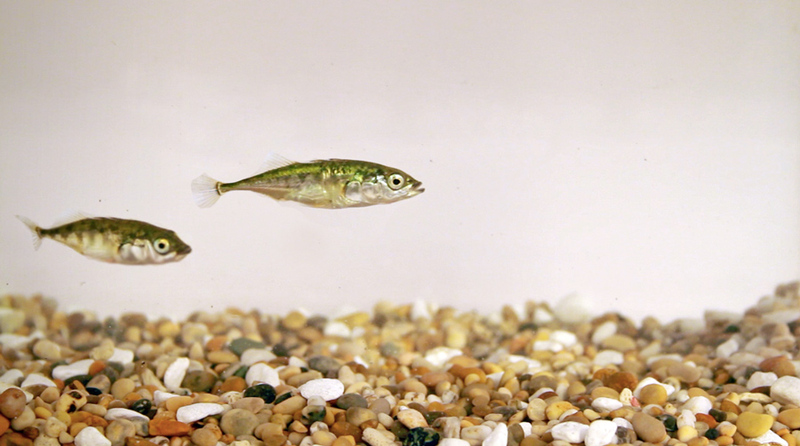 In the study, the researchers studied the behaviours of sticklebacks in tanks containing gravel and weed to imitate patches of a riverbed. The tanks were divided into two lanes by transparent partitions and randomly-selected pairs of fish were placed one in each lane. Separated by the see-through division, the fish were able to see and interact with one another. 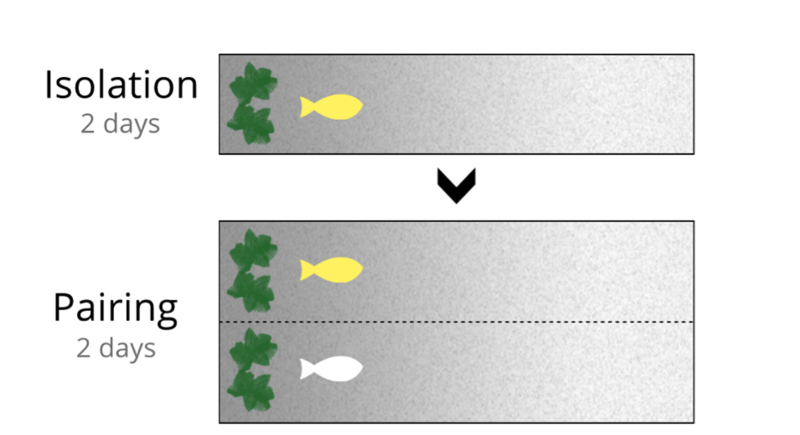 The positions and movements of the individual sticklebacks were recorded using sophisticated tracking technology, enabling accurate comparisons to be made of each fish’s role in the collective movement of the pair. “We found that individuals differed considerably and consistently in their tendency to approach their partner,” said Jolles. 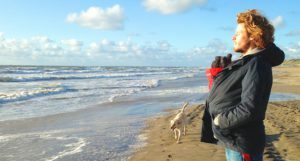 The study showed that more sociable individuals tended to be coordinated in their behaviour while less sociable individuals were more inclined to lead. Jolles explains that sociability may form part of a broader behavioural syndrome. “Our results suggest that bolder, less sociable individuals may often lead simply because they are less reluctant to move away from their partners, whereas shyer, more sociable, individuals become followers because they prioritise staying close to others,” he said. 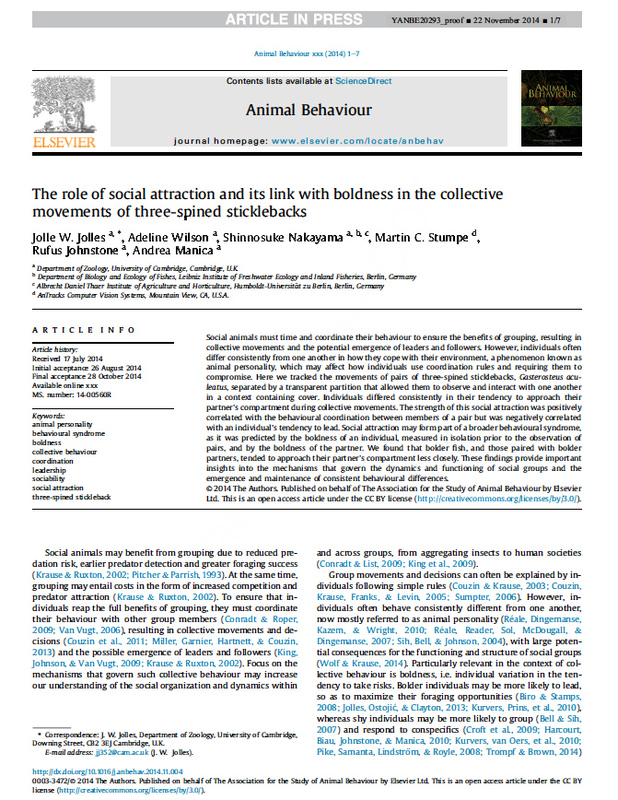 The findings of this study suggest that leadership and group coordination can be strongly affected by personality differences in the group and that boldness and sociability may play important but complementary roles in collective behaviour. Continuing on from yesterday’s post about the personality testing for boldness, today I made a time-lapse video from one of the sessions to get a quick overview of the actual running of the experiment. For most experiments I work with 40-64 fish per batch and potentially run multiple batches. Therefore, to be able to test all fish on the same day I test 8 fish simultaneously in 8 separate lanes for one hour and run 8 consecutive sessions in a row. Throughout the animal kingdom, individuals have been found to behave consistently different from one another over time or across different contexts. This is now mostly referred to as “animal personality”. As part of my PhD I want to understand what role such personality traits play in the structuring and functioning of social groups, i.e. in collective behaviour. Today I am running an experiment to investigate the consistency of risk-taking behaviour, also known as the boldness personality trait. I work with three-spined sticklebacks that I caught in wild streams near Cambridge. The three-spined stickleback is a wonderful little fish that is not only easy to work with and keep in the lab but a model system for collective behaviour and animal personality.